When I saw this cheesecake at Serious Eats the other day, it was a stop-what-you’re-doing moment. There was no thinking that I might have to try this someday, or I’ll have to remember this next summer. No, this was one of those times when I just immediately started writing a shopping list. There are bourbon-roasted peaches here for goodness sake. Those couldn’t be anything but great. 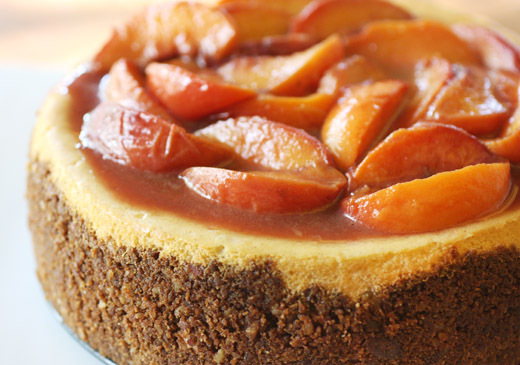 And, not only do those bourbon-roasted peaches crown the top, there are also some baked into the cheesecake. I now think my challenge with all the peaches I encounter during future summers will be to do something with them other than roast them with bourbon. So, the peaches were marvelous, the crust was made with graham cracker crumbs and finely chopped pecans, and the cheesecake was lightened with egg whites that had been whipped with vanilla seeds from two pods. In other words, every part of the dessert was delightfully flavorful. It makes a tall, stately cheesecake in a nine-inch pan, so I was happy we could share it with some friends who were in town for a visit. You begin by roasting the peaches. Half of them were sliced and placed on one sheet pan, and the other half were chopped into chunks and placed on a second sheet pan. Melted butter, bourbon, and salt were combined, and the mix was drizzled over the peaches on both pans. Brown sugar was then sprinkled on both sets of peaches, and they were roasted for about 20 minutes. The chopped peaches oozed more liquid while roasting, so I left that pan in the oven for a few extra minutes so the liquid would thicken a bit. The goal was for the liquid to become syrupy. Next, the crust was made and pressed into a springform pan. In case you’re wondering, for two and a quarter cups of graham cracker crumbs, you’ll need eight and a half to nine ounces of crackers. The crust baked for about fifteen minutes and was left to cool. To start the filling, egg whites were whipped with vanilla seeds scraped from pods, and sugar was slowly added. When, egg whites need to be added to another mixture, I usually whip them in a mixing bowl with a hand mixer. That way, I can use the stand mixer for the other part of the recipe and fold in the whipped egg whites without stopping to wash the bowl or attachments. Cream cheese, egg yolks, and flour were mixed until light, and cream was incorporated. The chopped, roasted peaches were added to the cream cheese mixture, and I wasn’t sure how much of the syrup should have been added with them. I scraped all of the syrup in with the peaches, but next time I wouldn’t do that. I think my cheesecake ended up with a little too much liquid in the mix, required extra baking time, and was on the soft side in the center. After adding the chopped peaches, the whipped egg whites were folded into the mixture. The cheesecake baked for about 90 minutes, and I left mine in the oven for ten minutes extra until there was just a little wobble in the middle. After cooling to room temperature and then chilling for several hours, it was served with the sliced, roasted peaches on top. I think I used some of the very last Texas peaches for this dessert, and it was a fitting way to end the season. If you don’t have an occasion to bake an entire, big cheesecake but can still get some fresh peaches, you should definitely roast them with bourbon and brown sugar. Use them to top some vanilla ice cream, pound cake, pancakes, or breakfast cereal. You’ll probably think of other uses too. I'm so excited that you made this. I wish you could send me a piece. I have been thinking about it ever since I saw it on SE. Wow, what a way to prepare a new peach cheesecake . 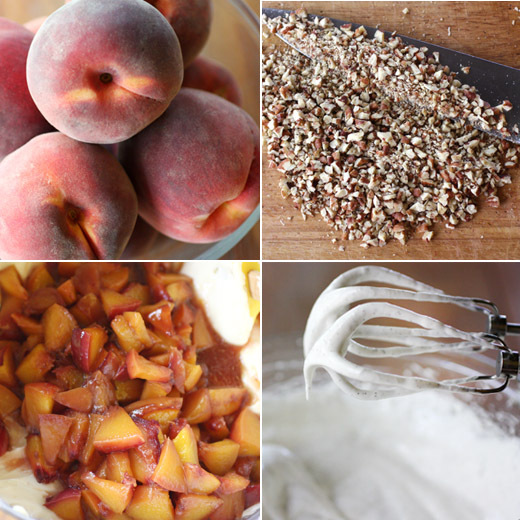 . . bourbon-laced roasted peaches! I'd run to bake this too! Genius and now printing off for one of my 'must-make' recipes! Thanks Lisa! Keep up the great (no . . . super) blog! I'm not the biggest fan of cheesecake but this one looks delicious especially with the bourbon roasted peaches. 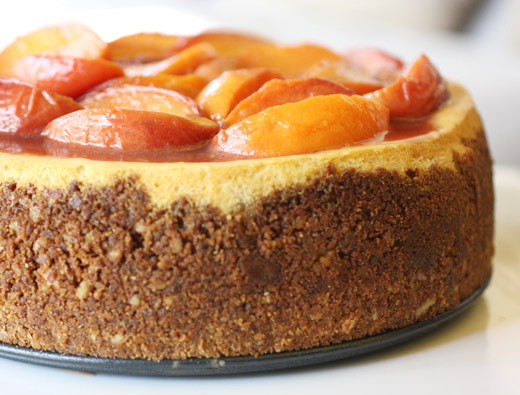 Lisa, your cheesecake sounds and looks incredibly tempting with whiskey roasted peaches. Yowzer! Gorgeous! I'm not a cheesecake fan either but wow does this look spectacular. Anything with peaches, really. My son is visiting soon and his favorite dessert is cheesecake. Every year for his birthday he requested cheesecake, rather than a birthday cake. He is going to adore this! peach desserts don't always appeal to me, and cheesecake rarely do, yet i find this quite enticing. terrific photos and description, lisa! Bourbon is, of course, big around here, and we love it. I perk up every time I see a bourbon recipe, but I don't think I've ever seen it with cheesecake. What a combo! This looks amazing! Picture looks beautiful makes me want to sink right in! This dessert looks amazing. I love peaches but have added them in a cheesecake, after seeing this I will have to try it. Loved the "stop what you're doing" moment. I have plenty of those in which a recipe hit me like a lightning, I cannot wait to make it. wow!! sooooo gorgeous and delicious looking! Wow - this looks wonderful. I've roasted peaches before, but never with bourbon. What terrific flavor that must add! This really looks spectacular - thanks for this. Wish I could taste yours. I am not good at making cheesecakes.